Step 1 is to choose gifts for the people you want to honor. Because each gift represents a small piece of CARE’s enormous body of work across 87 countries, you’ll be sure to find the perfect gift for anyone’s interests or budget. Found a great gift, but don’t want to donate the full amount? No problem! For the majority of gifts, you'll find a pull-down menu next to the price to buy a half- or quarter- portion of the gift. Your gift recipient will get the same great card regardless of the amount you purchase. Step 2 is to let them know with a personalized message or card. Each time you add an gift item to your CARE Package, select how you want to let your gift recipient know you’ve purchased a Gift of Lasting Change in their honor. 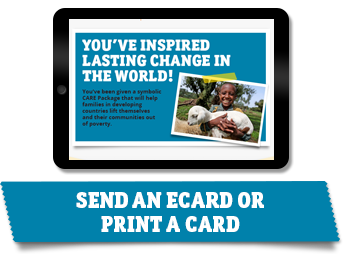 If you select, an ecard, just complete the short address form and add a personal message. If you prefer a paper card, select the "Print a Card" option for a card you can print, personalize by hand and mail. Just want to give and not be bothered with all this card business? Just choose "none". Step 3 is something we'll take care of! To help deliver the most effective solutions to the greatest number of people, your donation will be pooled with other contributions to CARE and used where it’s needed most urgently. Be assured each item in the gift catalog accurately represents CARE’s current poverty-fighting work. Your gift purchase is a donation to CARE that will be used to help deliver the most effective, lasting solutions to poverty to the greatest number of people. Know that your gifts empower women, girls and their communities while also being a unique and meaningful gift for someone special to you. 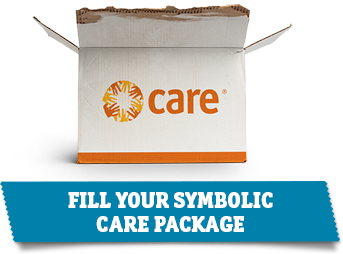 With 90% of CARE's expenses going to program activities around the world, you can be sure your CARE Package will make a difference in the fight against poverty.